Buy 3 Get 1 Free – Add 4 Bottles to Your Cart and You Will Get the 4th One Free! Use our towel cleaner to safely and easily remove any odor from any fabric. Light garden scent our customers love! 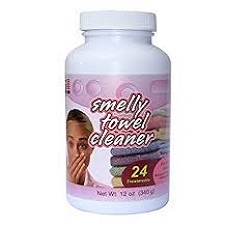 Are you sick and tired of your towels and clothing smelling like mildew? This customer favorite delivers safe yet powerful cleaning with just a hint of garden fresh scent to your towels and other laundry. Now you can soften towels naturally, boost detergent effectiveness and maintain your washer freshness…all while doing laundry! 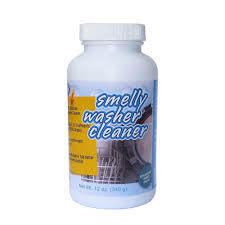 To remove odor from towels and laundry: add a level cap (1 tbsp) of Smelly Towel Cleaner with or without detergent to a full load of smelly laundry and complete a wash cycle. It’s that easy! Pause for more extreme cases. Consumer reviews don’t lie – people love this stuff! We are proud to announce Smelly Towel Cleaner has received the Eco-Excellence Award from NCW as a clothes cleaner. This all natural product guarantees to safely and easily remove odor from yoga, football, hockey, basketball or any other sport clothing by adding a capful to a load of laundry and will prevent odor from returning in any washing machine.